Graduating college senior, Cissie Graham Lynch, granddaughter of evangelist Billy Graham, takes on an internship at Samaritan’s Purse working with the Children’s Heart Project. She finds out that the task is not easy and filled with unexpected challenges. The Children’s Heart team turns to a Texas family who travels to Mongolia for the adventure of a lifetime to help bring the children to San Antonio for their surgeries. In Texas, two host families make sacrifices to care for these children and their mothers, while a team of doctors and nurses volunteer their time only to stare directly into the face of life and death. Since 1970, Samaritan’s Purse has helped meet needs with the purpose of sharing God’s love through His Son. Children’s Heart Project brings children with congenital heart defects to North America for life-saving surgery. Since 1997, Children’s Heart Project has helped hundreds of children from more than a dozen developing countries. Help mend broken hearts and give new life to children overseas. All rights reserved. Samaritan's Purse is a 501(c)(3) tax-exempt charity. *Samaritan’s Purse is not affiliated with any retailer. 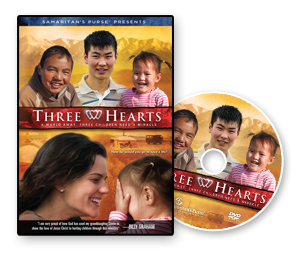 Three Hearts The Movie © 2014. All Rights Reserved.